Mark Brahier of Perrysburg, Ohio received the Dean’s Award. 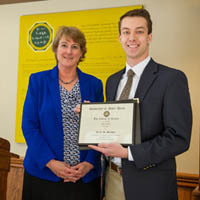 Presented to an outstanding graduating senior in the College of Science, the Dean’s Award recognizes students of exemplary personal character, leadership, service, and outstanding achievement. Mark Brahier majored in biology and completed a minor in international development studies. He was co-founder and coordinator of Dinners for Increased Scholarly Communication and the UPLIFT vertical mentoring program. He was one of the four members of the University Innovation Fellow team funded by NSF. He held a number of leadership positions including chair of the Biology Senior Leadership Committee and resident assistant in his dorm. Mark also excelled in service to others. He volunteered for World Medical Relief and for the YES project in Toledo which helps those in need. Mark completed two medical missions to Honduras and one to Guatemala, and served as an ND Learning Resources Center tutor. Mark will take a gap year and grow the business he co-founded and directs, POINTS Test Prep. POINTS specializes in standardized test preparation for high school students as well as curriculum writing and implementation for high schools. Following his gap year Mark plans to pursue a dual MD/MBA degree. 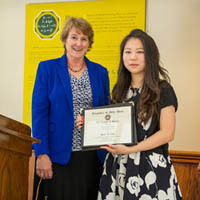 This year, the Dean’s Research Award was presented to two graduating seniors: Diane Choi of Indianapolis, Indiana, and Lawrence “Luke” Gray of O’Fallon, Illinois. 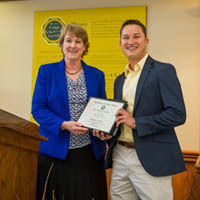 The Dean’s Research Award is given to the outstanding graduating senior in the College of Science who has conducted exceptional research within and across the traditional boundaries of scholarly disciplines and who embraces, facilitates, and fosters an environment of scientific inquiry. Diane Choi majored in biology and began undergraduate research during the spring semester of her freshman year, acting under the mentorship of Nicole Achee and John Greico. She worked for two years on a project involving the effect of spatial repellents on Dengue Vector attraction to experimental oviposition sites. Diane was first author of the publication, “Effect of Spatial Repellent Exposure on Dengue Vector Attraction to Oviposition Sites” and presented at the American Society of Tropical Medicine and Hygiene 64th Annual Meeting in October 2015. She received the Eck Institute for Undergraduate Research Award in spring 2015. Diane will remain at Notre Dame as a research coordinator with the Achee/Grieco lab. Her work will include traveling internationally to conduct research. She plans to matriculate into medical school in fall 2017. Lawrence “Luke” Gray is a chemistry with honors major and has conducted undergraduate research under the guidance of Prof. Bradley Smith, the Emil T. Hoffman Professor of Science. For the last three years, Luke has been involved in synthesizing and characterizing smart molecules for targeting and imaging anionic phospholipids at the cell membrane. Luke also investigated compounds useful for protein modification without disrupting their natural structure and function. As a result of his lab work, Luke is a coauthor on an article published in the Journal of Materials Chemistry C. Luke will attend medical school at the Uniformed Services University in Bethesda, Maryland, where he will prepare for a career as an air force physician. In addition to the three Dean’s Awards, each department within the College of Science presented awards to graduating seniors. Biological Sciences: Diane Choi, Philip Allen, Michael Dinh, Vincent Riccelli, Anna Szentirmai, Zoe Volenec, Amelia McReynolds, Luqun Shen, and Mark Brahier. Preprofessional Studies: Minyi Lin, Jasmine Moreno, Eleanor Sato, David Reed, Liesl Schroedl, Erin Peterson, Michael Shipp, Alex Hanna, Evan Panken, Michael Fliotsos and Jacqueline Stoneburner. Originally published by Tammi Freehling at science.nd.edu on May 19, 2016.